Macarons come in a ton of different flavors, but all macaron shells are made using two basic methods: Italian Meringue method or French Meringue method. Today you’ll learn all about the Basic Macarons using Italian Meringue method and what makes the two methods different from each other. Macarons are small, gluten-free confections made of sandwiching two almond meringue cookies with some filling in between. The macarons will take on the flavor of whatever filling they’re sandwiched with. 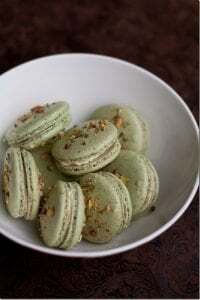 The macaron shells themselves have a very mild flavor of sweetened almond. When they are filled and have had a chance to mature (aka sit in the fridge with a filling for 24 hours), the inside of the shell becomes soft and very smooth on the tongue, all while the outside of the shell retains some of its crispness. So what is the difference between Italian Macaron vs French Macaron? Flavor-wise the difference is not big but noticeable if you have tasted enough of each kind. The French Method of making macarons will produce a rougher “crumb” of the inside of the macaron. The Italian method, however, tends to produce a finer crumb that is more gentle and smooth on the tongue. Most all commercially produced macarons are made using the Italian Method. Appearance-wise French vs Italian has a noticeable difference. The Italian method tends to produce smoother outside of the shell and very often, the outside shell seems to be a bit thicker and not as fragile as some macarons made using the French method. French vs Italian, what is the difference in Making Them? All macarons are made by making a meringue first, then adding a mixture of almond flour and powdered sugar into it. The difference between the French and Italian method mainly lies in how you make the meringue itself. The French Method will have you whip the raw egg whites and powdered sugar together and then combine it with the almond flour and powdered sugar mixture. This method makes the meringue less stable and easier to overmix and thus ruin the macarons. The Italian Method will have you make the meringue by cooking a sugar syrup and then adding it to the egg whites while whipping them continuously. Making the meringue using the Italian method creates a very stiff meringue, very stable and able to withstand a lot more mixing without deflating it prematurely. All in all, the results are more reliable when making the macarons using this method. How to make different Flavors of Macarons? 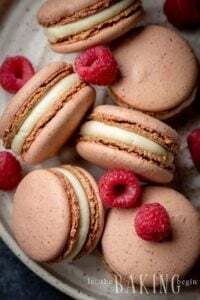 While all macaron shells are typically made of the same Basic Macarons’ ingredients (almond flour, powdered and granulated sugar) what gives them a different flavor is the filling or the topping. This means that having one good recipe for Basic Macarons will give you limitless possibilities for creating different flavors. 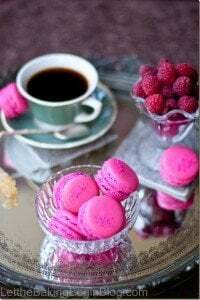 Since the macarons on their own are relatively sweet, the filling needs to have the right balance of sweetness or you will end up with tiny sugar bombs that will make your teeth ache. The best way to get a perfect balance is to dial back on the sugar in the filling. I will share a couple of choices in the upcoming couple weeks that you can pair up with these Basic Macarons. Sometimes the macaron shell flavor can be enhanced by substituting 50% of the almond flour with a different type of flour, like hazelnut, pistachio or even desiccated coconut. That ratio is pretty important to keep if you want a successful batch. But, if that flavor is not echoed in the filling or the topping, most of the time that change in the nut flour within the shell will not be enough to change the overall flavor profile of the whole macaron. Can you make your own almond flour? The short answer is – yes you can. You can use a food processor and run the almonds together with the powdered sugar called for in the recipe until the almonds are flour-like. Make sure to stop several times throughout and scrape down the sides and bottom. Also, do not overprocess or you will get almond butter. You can use a nut mill or grinder that has a fine attachment for grinding nuts into flour. Using THIS tiny mill you will be able to get the same texture that you get when buying pre-made almond flour. Proper Macaron structure with no hollows. Why is my macaron hollow? Often the macarons have a mind of their own that is next to impossible to read. There could be different reasons for why the macarons are hollow, but one of the easiest or simplest ways to eliminate hollow macarons is to bake them through properly. Just like the meringue will have a hollow inside if they’re removed from the oven too quickly (the unbaked part of the meringue just collapses once taken out of the oven), so will the macarons. The difference could be just 1 minute, so you really need to know your oven and your macaron recipe. It is better to overbake your macarons, which will give you a crispy throughout the macaron shell. But once paired with the filling and allowed to mature, the macarons will go back to being soft and moist on the inside. You can even quickly dip or brush the bottom of each macaron shell into some simple syrup (1:1 ratio of water to sugar), milk or even condensed milk before piping the filling to help with the maturation. In the end, no one will know that the macarons were overbaked. What happens when the macarons are underbaked? When the macarons are baking they rise up slightly and then they need time to cook through and “solidify” the inside. If the macarons are removed too quickly, the shells will rise up, but since they were not given a chance to solidify the inside by being cooked through, they collapse under its own weight. This gives you the top, and bottom with a large gap between the two. Can hollow macarons be saved? There’s no way to magically fix a hollow macaron, but there is something you can do to give the illusion of no hollow. When the macarons are just out of the oven, if you see that they have a hollow inside, you can gently press on the bottom of the macaron with your thumb creating a small dent. When filled with the filling, this will help to not have the huge space between the bottom and top of the shelf, thus giving the illusion of no hollow. After being made, the macarons need about 24 hours to mature before being ready for consumption. At about 24 hours is when they taste the best. The filling has had a chance to mingle with the shell and come together, delivering the best flavor. After that, the macarons need to be eaten or properly stored otherwise their flavor profile will decline. Yes. To freeze macarons, the macarons need to be kept in an airtight container. Better yet, it is good to wrap each macaron in several layers of plastic wrap before putting them into an airtight container. The freezer burn is all too quick to jump on and ruin macarons, so do not freeze the macarons for more than about 3 – 4 weeks. The secret to keeping macarons fresh is to eat them within couple days or to freeze them right away. Resting macarons is the process of leaving the macarons out until they no longer fill tacky to the touch. Some people will swear that resting macarons is what gives you a no hollow macaron. I have tested this theory and in this recipe, no resting is required. Since this recipe is created by a famous pastry chef who sells macarons (among other things) for a living, I not only trust my own experience but his too. Nevertheless, if you have attempted to rest the macarons from this recipe and you get better results that way, by all means, rest the macarons! At the end of the day, you’re the boss! I wanted to mention that I have tested out many recipes using the Italian Meringue Method and this one seems to be the most straightforward, without too much fuss and with great results every single time, at least for me. If at first, you don’t succeed, try, try again! Good luck and if you’ve made it at least this far, make sure to treat yourself with least one macaron! If you still have any questions that were unanswered in this post, go ahead and post them below and I will do my best to answer. Next, fold the whipped meringue into the almond mixture, in 3 additions. Continue folding until the mixture falls off the whisk like lava, forming a thick ribbon, that you can draw a number 8 with. The mixture shouldn’t be so stiff that it holds its shape, but it shouldn’t be so loose that it dissolves into itself and does not maintain the ribbon. It is better to for the mixture to be slightly stiff than too loose. Now, fill the prepared piping bag fitted with the 5/8th inch round plain tip (Ateco 808) with the macaron batter. You can drape the empty bag over a tall glass to make it easier to fill the pastry bag. Pipe the macarons onto the prepared parchment lined baking sheet by pressing out 1.5-inch circles about 1 inch apart. Rap the sheet against the counter 5-10 times to remove any large bubbles. If you use a softer surface to avoid the loud noise that comes with rapping the sheet on the counter, increase the number of raps. Next, use a pin or something sharp to pop any remaining bubbles that have risen to the surface of the macarons, but haven’t popped. Place the baking sheets into a preheated to 350F degrees oven and immediately reduce the heat to 325F. Bake for 10-12 minutes. Remove from the oven and allow to cool completely before removing macarons off the parchment paper. Bake rest of the macarons in the same fashion, preheating the oven to 350F before each new baking sheets is placed in the oven. To fill, use either a ziplock bag or a piping bag fitted with a 5/8th inch plain round piping tip (Ateco 808) then filled with cream. Filled macarons should be allowed to mature by refrigerating them for 24 hours before serving. 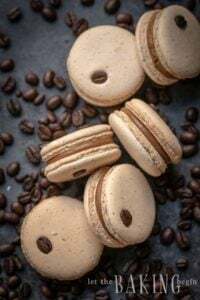 Coffee Macaron – Coffee flavored macarons with a dulce de leche cream. 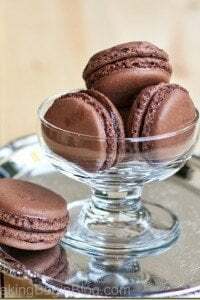 Chocolate Macarons – Simple chocolate macarons with a classic filling. Line two 15in x 21in baking sheets with parchment paper or a silicone baking mat. Preheat oven to 350F with the baking rack in the middle. Gather all of your ingredients and equipment. Separate eggs and reserve 172 g of egg whites. Place them in the microwave for about 40 seconds and heat in 5-7 second intervals, mixing in between each interval. Add the remaining egg whites (82 g) to the almond flour and powdered sugar mixture that was sifted earlier and mix together into a thick paste. In a small saucepan combine 236 grams of sugar and 158 grams of water. Place over medium heat. Stir the sugar until it dissolves, being careful not to splash over the sides of the pot. Bring to a boil, then reduce heat to medium and continue cooking until about 235F-240F. Once the syrup reaches 248F, remove from heat and white the mixer running at the highest speed slowly pour the syrup between the bowl and the whisk. Continue whipping for about 8-10 minutes and until the bowl is cool to the touch. This is when you would add gel coloring if the macarons are to be colored. The mixture shouldn't be so stiff that it holds its shape, but it shouldn't be so loose that it dissolves into itself and does not maintain the ribbon. It is better to for the mixture to be slightly stiff than too loose. Fill the prepared piping bag fitted with the 5/8th inch round plain tip (Ateco 808) with the macaron batter. You can drape the empty bag over a tall glass to make it easier to fill the pastry bag. Rap the sheet against the counter 5-10 times to remove any large bubbles. If you use a softer surface to avoid the loud noise that comes with rapping the sheet on the counter, increase the number of raps. Next, use a pin or something sharp to pop any remaining bubbles that have risen to the surface of the macarons, but haven't popped. Place into a preheated to 350F oven and reduce the heat to 325F right away. Bake for 10-12 minutes. Remove from the oven and allow to cool completely before removing off the parchment paper. Bake rest of the macarons in the same fashion, preheating the oven to 350F each time a new baking sheet is placed in the oven. If there are sugar splatter on the sides of the pot when making syrup, wash it down with a wet brush to prevent formation of large sugar crystals. If the syrup crystalizes, discard the syrup and start over. If the egg whites do not look smooth and look lumpy or "curdled" instead when whipping them, discard and prepare fresh set of egg whites for this step (about 90 grams), remembering to heat the egg whites. To fill macarons, use either a ziplock bag, or a piping bag fitted with a 1/2 inch plain round piping tip (Ateco 808) then filled with cream. The first time I used this recipe was my first time ever making macarons and they were perfect, albeit a little ugly due to the learning curve of properly piping them. However, the second time I made them, my feet deflated! They looked great but a little tall coming out of the oven. Once they cooled, there was so little left of the feet that it more looked like a seam on the bottom of the cookie than macaron feet. I had to tend to my 3-month-old throughout the course of making these so it ended up taking a few hours from start to finish. I’m thinking that my meringue deflated too much before baking but would like to confirm if you think my suspicions are correct or if there was something else that could be the culprit. Macarons are a hard thing to master, but koodos to you for braving them with a 3 month old! When the macarons bake they go through a bell curve. They start out with no feet, just meringue, then about halfway through they rise very tall, with very tall feet. As they continue baking, they deflate just a little, leaving a line of ruffled feet at the bottom. From this point on, they do not change and if you took them out of the oven right then, they should stay the same as they cool. But! If you took them out at the peak of their “tallness”, you took them out of the oven too soon, because the inside was still not baked through, so when they hit the cold air they deflated. When they bake, look for this “bell curve” of baking – watch as they inflate, then slightly deflate and only then check if you can peel one macaron off the parchment paper. They should not come off completely clean, but should come off somewhat. If they come off somewhat clean, as they cool the bottom will dry up a little more and they will peel off just perfect. Does this makes sense? It’s kind of hard to explain this, but I hope it made sense. Thank you for this! Iv’e struggled with the French method for the past couple months, never getting it right. I always ended up with hollow shells. I never tried the Italian method until I found this. Turned out right the first time! Yes there are more steps than the French version, but the taste in my opinion is much better. I wanted to try and flavor it with Matcha. Would it throw the recipe off if I added a little to the almond/sugar mixture? Or should I come up with a Matcha filling? Sorry for the long post, and thank you again! Hi Craig! your success makes me so happy! For Matcha flavored macarons I would dye macarons green and then use the matcha for the filling. #1 – some of your utensils might’ve had some grease (egg yolk?) on them which prevents the whipping of the egg whites. Or you added the syrup too fast and it overcooked the egg whites. Or, the syrup never got to the appropriate temperature in which case the extra water in the syrup would prevent it from whipping. If you do attempt this recipe again, do make sure to follow the recipe exactly. The temperature of the syrup is imperative to your success. The second super crucial step to success is folding the egg whites to appropriate consistency. Hi – when I add the hot syrup to the egg whites in a slow steam, the egg mixture gets too hot. Even though I keep beating it, it seems be melting. What am I doing wrong? Just made my first batch of these and though they have turned out better than any French macaron I have tried (2), most of them domed & cracked. However, I can tell that they’ll work out after I practice some more. (I’m brand new to macarons). The flavor of these is far superior to any macaron I have tried making and have bought. I’m going to keep trying. Great recipe. But how do you pour the hot syrup in the bowl without it splashing it around the rim? And how far do I beat the egg white and 2 tbsp of sugar mixture before I add the hot syrup? When you pour in a thin stream, just aim between the bowl and the whisk. You should beat the egg whites and the 2 tablespoons of sugar on high speed for about 30-45 seconds or until they are foamy. I’m fairly competent as a baker, no pro by any stretch and wholly self-taught, but I’m generally proud of what I send out of my kitchen. However just the logistics of this request is making me extremely nervous. I haven’t the room even to store the eggs, much less space for pans to form skins, fridge space to sit 24hrs, etc. I don’t want to disappoint my Aunt-in-law, and frankly I think it would be a blast to try…I guess I’m just looking for any/all advice when it comes to making multiple, MULTIPLE batches, and having them all ready/fresh at the same time? For 13 dozen you would probably need about 2.5 to 3 recipes. As overwhelming as it might seem, I think it can be done. If you’re using a ganache based cream to fill them I would start on that the day before making the macarons themselves. I would not mix more than one batch at a time, as the recipe already makes a large batch and if you mix more than one, by the time you pipe the last couple sheets, the meringue might deflate more than needed and not produce proper macaron shells. So just mix 1 recipe at a time. While 13 dozen sounds like a lot, when you make them and stand the macarons on its side it should probably not be more than two full rectangle jelly roll (12×16 inches) sheets. This recipe does not call for leaving the macarons out to form the skins, but if you feel that your macarons come out better after leaving them out, I would stack the baking sheet pans one on top of the other, just make sure to put them in the opposite direction to each other to save space. Please help me figure out what I’m doing wrong! I keep having the same thing happen, and I’m so frustrated. I cooked the syrup to the right temperature, beat the egg whites w/ 2T sugar til frothy, then drizzled the hot syrup down between beater and bowl, while beating on high. But then as I settled in for the 10 minutes of high-speed beating, instead of growing frothier and stiffer, my mixture became thick, shiny and wet. It looks like marshmallow frosting. No amount of beating seems to change this. Not an air bubble to be found. The first time it happened, I started over with the whites and syrup, but it ended up being a repeat. I don’t want to bother adding it to the almond paste because I know it won’t turn out right, so there’s no sense. What an I doing wrong? Wah. I’m not sure what it means when you say “wet”. Does it look like the pictures in the recipe? I think you might be just overthinking it and should just add the meringue to the almond flour mixture and keep working the recipe and then see if it will work, because after adding the syrup the meringue is supposed to be stiff, but pliable and kind of like marshmallow frosting. When the meringue is beaten, you shouldn’t be able to see visible air bubbles, as they should be super tiny (microscopic). Thank you for responding so quickly! No, mine does not look like the picture. It lays flat and heavy in the bowl (as opposed to yours having some fluff to it). It also doesn’t form any peak at all, just drips right off the beater. It really has no stiffness at all. I actually am having the same problem!! I added the meringue in and finished baking them but they came out completely flat and the feet seemed to be “exploding” from the side. Sometimes this happens when the batter is mixed too much and there is too much heat coming from the bottom. Try to either use double baking sheets (to prevent too much heat from the bottom) or place the baking sheets on the next higher rack when baking. The fact that they didn’t get any air in could mean that some grease got into the egg whites. Either the bowl or the whisk might’ve had remnants of the egg yolks or grease, or some of the egg yolks got into the egg whites as they were separated. Another problem could be that the syrup was added into the egg whites too quickly, overheating and thus slightly cooking the egg whites. Could this be the problem? Hi. Did you use pasteurized liquid egg whites by any chance ? How do I make white macarons and, how do i cook them without browning? I’m making little pandas. Thank you ahead of time! If your macarons are browning, you’re overbaking them. You should be removing them from the oven before they gain any kind of browning. Also, if the macaron batter is properly made the macarons should be fairly white as shown in some of the pictures in this post. If the macarons brown before being cooked through, lower the oven temp. Ovens are different and sometimes run hotter than what the temperature dial tells you, so just turn it down and go by what the macarons tell you. If I want to give the macaron shell a flavor by adding cocoa powder or any other flavor …what will be the measurements that I need for almond flour and the extra flavor? Also what if I want to color the macaron in which step can I add the color gel? 1. Is it accurate to say the two Tbsp of sugar in the egg whites is in addition to the 236? 2. Is it accurate that there is no waiting/dry time – just pipe and bake? I have asked questions, evaluated this recipe and have made it many times now. It is BY FAR the best recipe I have used, it produces consistent macarons that everyone enjoys. I love it. Awesome feedback, thanks so much! This is the most comprehensive macaron recipe I’ve ever used and I have done several. People struggling to get these right need to try your instructions. I’m turning out racks and racks of perfect shells with not one crack. I’ve even done almond free batches using ground seeds and you couldn’t tell the difference. Hi Jana! You have no idea how happy your comment makes me! this is awesome! Will frozen egg whites work with this recipe? Yep, just make sure they’re slightly warm before using. Can you use the carton egg whites for this recipe? I haven’t tested them with carton egg whites, so can not tell for sure. If I had to guess, I would say that it should work fine, just as long as you heat them to room temperature. How can I achieve the feet of the macaron. So excited these macarons came out just perfect! Have been struggling with french macarons so tried this method and am so glad I did, a bit more fiddly but hey the results speak for themselves. hi! at the step where you start whipping the egg whites, do you add 2 tbsp of granulated sugar or the sugar syrup? The egg whites are whipped with 2 tablespoons of sugar until soft peaks, then you add the syrup. What will happen if we make a meringue (Italian Style) using all the egg whites and then sift and fold the Almond Flour mixture on it just like in the French method. Instead of dividing the egg whites for the Almond flour mixture and the meringue. Well, that’s a good question, but unfortunately I don’t know :(. The only thing I can tell you is that every Italian method macaron recipe I have seen divides the egg whites and only about half is whipped. If you do try whipping all egg whites and would like to share the result, I would really appreciate it! Hi, I really liked this recipe but I have a question – at the 350 and turn immediately down to 325, my tops started getting brown. I have a convection oven. Adjustments? Thanks! I would set the baking rack lower in the oven or experiment by starting then at 325F, and then immediately turning them down to 300. Convection setting tends to be hotter than regular baking setting. Sorry, it is me again. Have you ever try using dehydrated egg white? Yes, I know, macarons can be so overwhelming at times 🙁 I mentioned in the post that it seems that everyone has to come to their own “perfect” recipe, as two different people baking following one recipe can produce different results. I haven’t tried the recipe with the dehydrated egg whites, but if you have some dehydrated egg whites, I say try it. Why do you heat the eggs? Why would room temperature not be sufficient? To be honest, I have only done it with aged (24 hours at room temperature) eggs or heated. Haven’t tested it with eggs that are just room temperature. So not sure if it will still work with just room temperature eggs. Hi Marina, amazing post, thank you!!!!! I have a question about humidity? Raining days? Is there truth that in high humidity macarons won’t work? What is the ”perfect” temperature/humidity to bake those little guys? About a month ago I felt in love with them, and I have been baking them since them. Really EVERY SINGLE DAY. Some days it works, but lately, they come out with a hollow. I even got a dehumidifier. Can you give me some ideas, pls. Thank you some much. After so many recipes and so many fails I finally made perfect macarons. Whoohoo! I’m so excited for you! Thank you for sharing your feedback! I hope it gives confidence to others with similar past experiences to try this recipe. Is there something I am doing wrong? it is happening to almost every batch? I’m sorry macaroons are giving you trouble! If this was happening to me, I would try baking them on a double sheet, and lower the oven temp by may be 25F. If you’re doing everything according to the recipe, by the time you put the second sheet of macaroons in the oven they should form a non-tacky surface. Does that happen when you make them? If not, that means something within the recipe didn’t go according to plan. so a few questions, Do I not need to age the eggs before using the egg whites (let it sit on counter top for a day before cracking it open, or crack it open and let it sit for a day, whichever method it was) Do you just take egg out of fridge and use it right away, by microwaving them? Also after taking them out of oven, do you need them to rest some hours or anything? Or just wait until cool and then fill? A theromether is a must to know the temperature of the water syrup huh. Darn, I would need to buy that. Aging eggwhites – no you do not need to leave them out or anything, I never do. Just heat them in the microwave to bring them to room temperature and you’re good to go! After you bake them, you cool them and fill. Then you need to refrigerate the filled macarons for at least 24 hours for best flavor and texture. Depending on the moisture content of the filling, you might need more or less time for maturation. I’m guessing it’s working for you too! Glad to hear that! help !! i followed the recipe as best i could and the batter looked good enough/seemed to be the right consistency. however when i tried to bake the first tray they came out super grisly and flat and… nasty. im sure it was during adding the meringue and the stiff batter, but is there any way to fix this? maybe letting a skin form? Any difference if we rest and don’t rest the macaron before go into the oven? Because of most of the methods are to rest until the shell set. I know that many, many people do say that you need to rest the macarons in order to have success, but in my countless batches of macarons I have not seen any difference between rested and not rested macarons. If you have folded them properly and the batter is of the correct consistency it should not matter if they’re rested or not. This recipe is from a famous pastry chef here in the states. I have other recipes that use the regular method of macarons by a different famous French pastry chef and he too states that there’s not difference. At the end of the day though, you decide what works for you. If you find that resting them produces better results, do that 🙂 But as far as I am concerned, there’s no difference. I have tried and failed the french Macaron method, more times than I can count, i always get hollows. I tried your method, twice, and I got the perfect consistency, no hollows. But both batches were lopsided. Any idea why? Also, do these have to be rested? When you say “lopsided” what exactly do you mean? Could it be because you were using convection and the air was blowing from one side, making them tilted? Tell me more about what you mean. Or may be shoot me a picture on Facebook or Instagram? Sorry they were gone so didnt get a chance to take a pic. Will be trying again tomorrow. Hopefully it was just underfolded. Do these need to rest? Thank you! Also, im using a conventional oven. I just finished another batch of these about half an hour ago and nope, you don’t need to set them out before baking. Just pipe, rap against the counter and into the oven they go. A way to know if you’ve folded the batter enough is if you can “draw” a digit 8 with the batter dripping off the spatula, you’ve folded enough. Do not fold until the batter disappears into itself quickly, at this point it’s too thin. Then in step 5, whip the egg whites with the sugar. Ok. Got that. But if I mess up, start over with 82g of egg whites…shouldn’t that be 90g? I have updated the recipe to be more clear and precise with the instructions and measurements. Please let me know if you have any questions! Hi Marina! I love your step by step explanations. I have been using the Italian method for years now due to forgiveness of the recipe. Our recipes are similar but yours uses more water for the sugar syrup. I will have to try it with more water. Beautiful work! Help, everything was perfect until I cooked them and they cracked on top and the feeling oozed out, what did I do wrong???? Usually the cracked tops mean that there was still too much air in the macaron shells. Try to fold it just a couple more times until the batter flows off the spatula like lava and takes about 30 seconds to disappear back into itself. Also, make sure you rap the sheet against the counter to remove any big bubbles that might cause this. Also, what filling are you referring to? Sorry, I meant just the inside of the cookie, and after doing research that is what exactly happened I did not fold it enough. Can you use almond meal instead of almond flour? I’m sorry, I’m still not clear on what exactly you mean. Would you please clarify? Almond flour and almond meal usually mean the same thing, so you can use them interchangeably.